Modern Sofas – Genuine Leather or Bonded Leather? Leather furniture can add beauty and sophistication to any room, no question. A well made leather sofa is durable and can last for generations. However, the market place is currently full of diverse leather and leather-like products for you to choose or rather confuse! Understanding the leather products will help you to make the right choice when shopping. Genuine leather is made from the hides and skins of animals. They are then tanned with vegetable tannins and chromium salts. They are known for strength and grained texture. Whereas bonded leather is shaped when leather scraps and fibers are mixed together. They are then twisted into a roll using glue or other bonding materials. 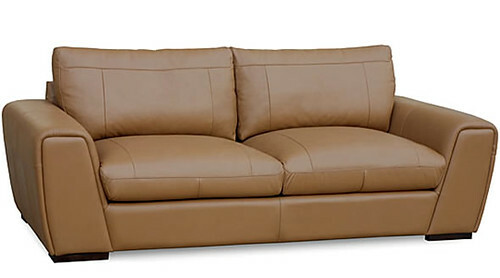 It is very hard to differentiate between bonded leather and genuine leather as far as quality and looks are concerned. If the bonded leather is done suitably it may look akin to genuine leather with the same smell, appearance and function. In that case, you may look for the texture of the bonded leather which may not be as well-defined as that of the natural-grained genuine leather. While bonded leather has the reputation of being not as durable as genuine leather, the bonded leather on my BMW seats holds up very well. It actually looks even better than some of its genuine counter parts, which tend to become wrinkly over time. On the other hand, genuine leather has the reputation of getting better with age. It usually becomes more soft and worn in, giving it the unique look. The cost advantage is the main benefit of bonded leather. Due to its economical price (bonded leathers are 30% percent less) many people can afford high-end furniture—great looking designs at low price. And here is an entirely different perspective: Considering the fact that bonded leather is made from scraps, that would otherwise be wasted, it might be a good idea to go for bonded leather furniture from an environmental point of view. Beliani uses both bonded and genuine leather for their modern leather sofas. Thus, harvesting the advantages of both materials. The appearance of your living room reveals your personality and taste. Therefore it is essential to take all possible steps to make your living room look classy and elegant. A living room equipped with sophisticated furniture makes it more welcoming for guests and leaves a strong impression. To often we see living rooms where obviously somebody tried but didn’t quite succeed in transforming the space into that distinguished, stylish retreat. Choosing quality furniture smartly and prudently is one of the secrets to having a stylish living room. So, consult your interior designer, whenever in doubt, or maybe sometimes just to confirm your plans. When beautifying your living room, one piece of furniture that you should always count on is a modern sectional sofa. A uniquely designed sectional sofa greatly adds to the elegance of your living room. Sectionals always look more inviting than standard sofas; they present a more open space to the visitor. Nobody will feel that they’re wedged in or awkwardly stuck in the middle of a 3-seater. 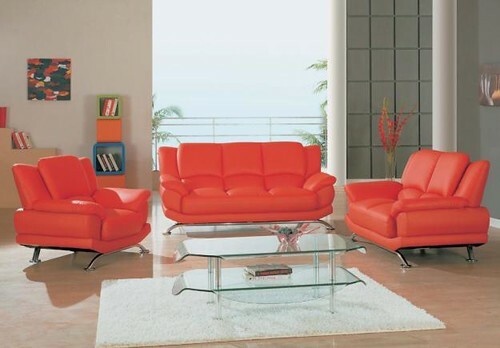 You will find sectional sofas made from leather, micro fiber or traditional fabric. These sofas usually provide a generous seating area with deep seats. Some sectional sofas come in three or more sections with ottoman which makes it possible for you to decorate and redecorate your living room according to your mood, style and occasion. In order to create a perfect setting for conversation during a family or friends get together, the ideal way to arrange a modular sectional sofa is to place two of the small sofas in “L” shape, just right for corners. You can place an ottoman at an angle. Add a coffee table and a create the right mood with free standing lamps. If your sofa is not modular, add other seating to complement the conversation area. Another great idea to create a comfortable yet classy look with a sectional sofa is to go for a black leather. It’s a sign of sheer elegance and is perfect for you if you want to project a simple and straight-forward feel to the visitor. Moreover, having a black sectional means you more easily change other furniture and decor, as black complements well with other colours. A round sectional sofa is again a great option if you want to adorn your living room in a unique way. If you are bored of square and rectangular sofas and have the space, a circular sectional sofa is great way to add excitement to your living room. A circular sectional sofa look great, even in a square shaped room and creates a cozy ambiance besides adding to the visual appeal of your living room. A sectional sofa will be one of the smartest investments in your home; you can make your living room look warm and inviting and facilitate conversation with friends and family. You will have a hard time getting them to leave! The beauty and elegance of your living room depends on proper maintenance of the furniture that fills it. After all who doesn’t want to create a good impression on their guests and brag a little about their plush living room decoration, right? Leather sofas are an important component of many living rooms. 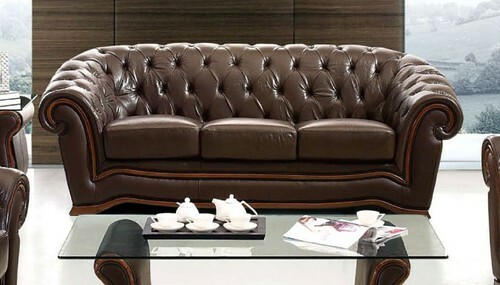 Hence, proper maintenance of leather sofas is very essential to preserve the grace and beauty of your living room. Here are 10 essential tips that will guide you to take proper care of your leather furniture. 1. Follow Instructions: In order to take proper care of your couch, always follow the manufacturer’s instructions. 2. Cleaning: Ideally you should contact the manufacturer to clean your furniture. Alternatively you can use the help of professional cleaners to clean leather sofas without damage. If you prefer to clean modern sofas yourself, always use a vacuum for loose dirt or soap to remove stains. Ensure that you are using a soap without chemical additives. 3. Avoid harsh cleaning solutions: You should never use harsh cleansing solutions to clean modern sofas as they might damage the surface of the leather drastically. 4. Protect leather sofas from direct sunlight: Excessive heat and direct sunlight can damage leather and cause it to develop cracks. Therefore, ensure that your leather furniture is placed away from direct sunlight or shield your living room with blinds or drapery for protection. 5. Clean up spills immediately: Leather is extremely porous in nature and if you don’t clean the spills instantly, the liquid will penetrate and can leave an everlasting stain on your furniture. 6. Take special care for removing stains: You should follow different procedures to remove different kind of stains. For example, in order to get rid of an ink stain, use a cotton swab and dipped in Isopropyl alcohol. Then gently rub the cotton swab on the stain. Next, dry the area with the help of a hair drier, set on the lowest heat setting. For removing grease stains, avoid using water and instead clean the stain using a dry rag. 7. Daily Maintenance: Clean your leather regularly using a vacuum cleaner or a damp cloth to get rid of dust from the surface. Also, you should use a leather conditioner once every three months. To protect the natural sheen of leather, use leather protectant spray once every month. 8. Get professional help: If you notice any cracks or rips on your leather sofa, contact your retailer or ask for the assistance of a professional sofa repair company. 9. 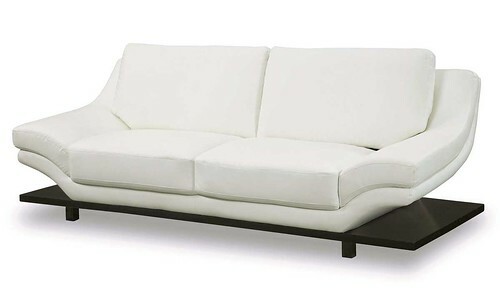 Protect sofas from sharp objects: You should always protect your leather from sharp objects like knives or scissors. Even jewelry can leave ugly scratches. 10. Keep pets away: Pets can seriously damage leather furniture. I know you love your little ones, but make sure you train them to not jump on your furniture, or assign them their spot on a blanket to protect the sofa. Sofas constitute the main component of a stylish living room; therefore you should take regular care of your leather sofa. The above tips will help you maintain the integrity of your product and enhance the longevity of your leather sofa. Are you bored of your sofa set and planning to give your living room a facelift with new modern sofas? Here is a peek at the best sofa designs for 2012 to jazz up your living room. 1) Modern Pluff Sofa: For those who are looking for unique sofa designs, these modern pluff circular sofas designed by Massimo Losa Ghini would be the ideal choice for you. The pluff sofas are designed to provide you with optimum comfort and luxury. The extravagant sofas made in Italy are available in a wide variety of designs and colors. These exceptionally designed plush sofas can be a great addition to pep up your living room as well as your library. 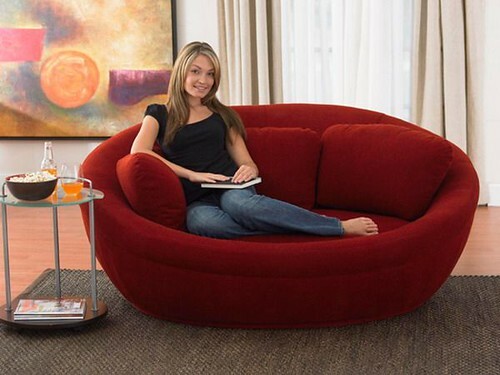 2) 2012 Red Nest Style Circular Sofas: If you are looking for a comfy couch for your living room, then you might consider the Red Nest. These modern sofas are uniquely designed to steal your heart at first sight. The round shape and corners of this sofa make it a cozy cocoon. Nest style sofas are so comfortable that once you sink into it, you will never want to get up! The European design is especially suited for sleek interiors. 3) Small Trendy Sofa Design: Do you have a small living room with limited space to place a sofa? For those who find it difficult to beautify their living rooms with classy sofas, a small trendy sofa could be the best choice for you. Many fashionable designers are creating small couches and settees specifically intended for small spaces. Besides being comfortable and stylish, these sofas are an efficient way to add elegance to a small living room. So overcome the challenge of redecorating a small living room and wow your guests with a small trendy sofa this year! 4) Colorful Exotic Sofa: Are you someone who loves to experiment with different colors? If yes, then these colorful modern sofas are meant for you. Each color has its own significance and expression. Moreover, a colorful ambiance uplifts our mood and spirit. Why not give your room a colorful makeover this year with a sofa like this? The popular European design will symbolize your lively and jovial personality. So, get this trendy sofa for your living room and let the colors do the talking! A sofa is a very personal choice and reflects on your personality. If you are looking to add a stylish European design sofa to your living room, visit Beliani.com and check out the new collection of leather sofas and modern sectionals. A unique sofa design will surely spice up your living room and enhance your quality of life. Is Michael Bublé sitting on a Beliani Chesterfield sofa? 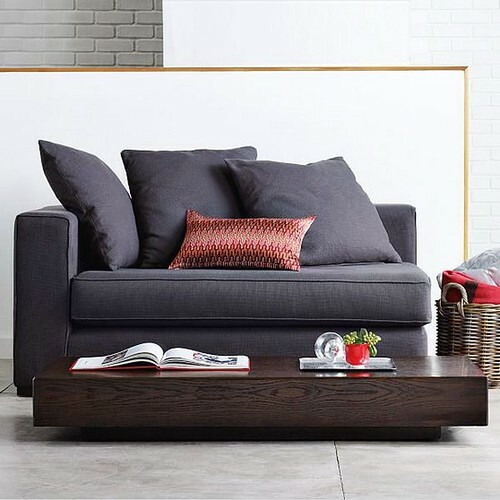 I found the photo in the House & Home magazine and can’t get the thought out of my head that this might be a Beliani couch. 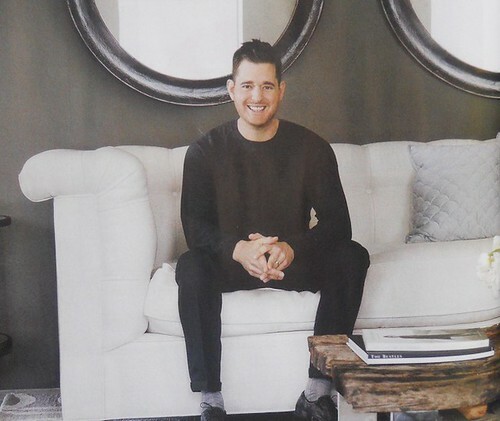 The photo shows Michael Bublé in his Los Angeles home, nothing short of a mansion, btw. The man has made oodles of money in the past years, selling his music albums all over the world. He is currently featuring a Christmas album, which I have not yet heard, but the marketing looks excessively cheesy, unfortunately. But that’s not the point here. He is a fantastic singer, so definitely deserves all the success, and oh, yes of course, he is Canadian, what else! In the photo, he is smiling at us from a leather couch that could be mistaken for a Beliani Chesterfield sofa. I know, the man can afford the top of the line brands. But why not save close to two grand and buy a leather sofa with Beliani, that is almost identical to the original designer piece. Who can’t use that money for some other nice things, especially when the holidays are right around the corner?!? 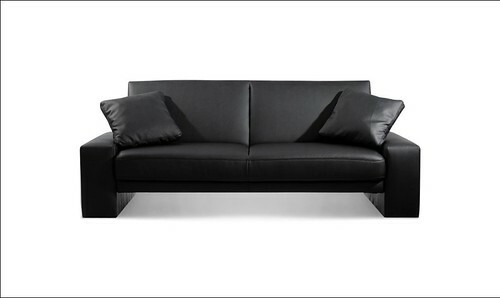 This is just one of the Italian design leather sofas that Beliani is bringing to Canada. There are many products out there to choose from and certainly no lack of retailers for sofas and other furniture. But here is the thing: If you go to the Brick, Leon’s and the like, you are not going to spend a lot of money, but you also know, you will get furniture at the lower end of the scale. If you want a nice modern design, and don’t want to spend $5000 or more on a nice sectional, you’re most likely out of luck. 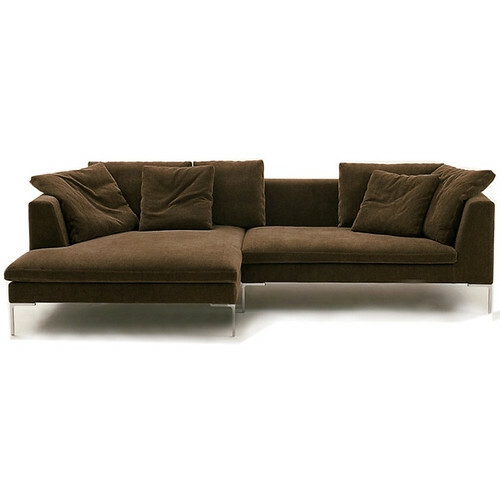 Beliani overcomes all the obstacles involved with furniture such as modern design sofas. Purchasing directly from manufacturers and selling online, cuts down on the cost significantly, and guess what, the consumer benefits by paying much less than with a conventional retailer. Now there are drawbacks too: Beliani cannot offer a huge variety of products. The collection is limited to a few different models in only a few colours. And there are no beautifully decorated retail stores in the middle of downtown. But Beliani can offer a great customer service over the phone and online, and a 14-day full money back guarantee. Follow this link to find modern sofas in Canada. Who has not seen at least one of the plenty of home TV shows, displaying how easy it is to sell a well staged home, or how to turn you tired interior into a dream. The emphasis is often on the furniture that gives the home this stunning look. Very important in this respect are sofas. They are the focal point of the living room and make or break the appeal of the often largest room in a house. The video shows one of the European style sofas that Beliani is bringing to Canada this fall. Genuine leather paired with a clean Italian design makes this sectional sofa a great choice in today’s modern home. Beliani does a great job in making these designer sofas available to the public at super-low prices. Here is a quick glimpse into the new line of indoor furniture that Beliani is bringing to Canada. 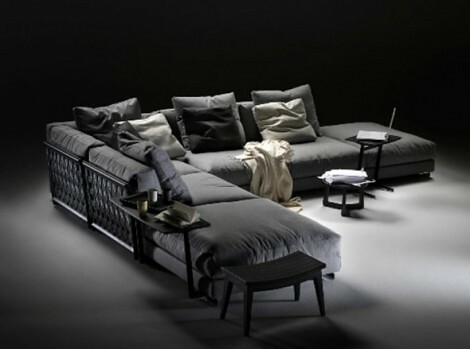 The Italian design sofa will be available later in the year at a very competitive price. Other European designs will follow in the usual high quality.